Pastor Anne was called to serve Christ Fredericksburg as Pastor in December 2017. She was ordained and installed at Christ Fredericksburg on November 9, 2013. Previously she served Christ Fredericksburg as Pastor with Pastor Richard M. Carbaugh (retired) from 2013-2017 and as Intern (2012). Pastor Anne grew up in Conover, North Carolina. She earned a B.A. in Religious Studies and Family Ministries and a minor in Spanish from Lenoir-Rhyne Univeristy, a Master of Divinity from Wake Forest University School of Divinity, and a Master of Sacred Theology from Lutheran Theological Southern Seminary. Pastor Anne is married to Max and they have a newborn son, as well as a rescue dog named Sam and a cat named Gregory. 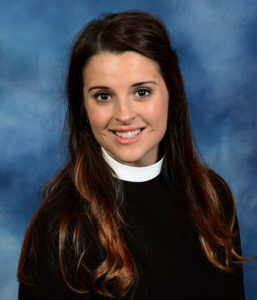 She currently serves on Micah Ecumenical Ministries Executive Board and on the Virginia Synod’s Candidacy Committee, Youth Ministry Committee, and Ministerium Committee. Pastor Anne loves the community of the church, the paradox in Lutheran theology, and worship.